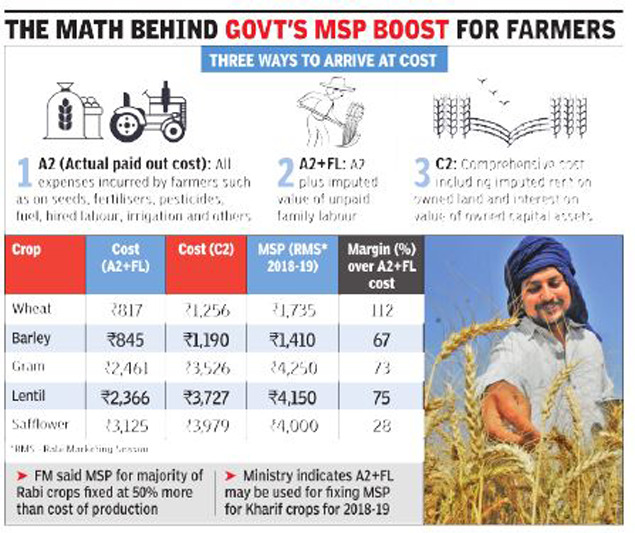 NEW DELHI: The government is likely to fix the minimum support price (MSP) for kharif Crops with the formula used for rabi crops for the 2018-19 marketing season—with costs of all inputs and Unpaid Family Labour plus 50% as the benchmark to fulfil the Union Budget‘s promise of higher prices to farmers. The procurement of summer sown crops at the increased price will begin from October. The new price, which will be 1.5 times the cost of production, is to be the benchmark for all crops that are to be covered under MSP. Official sources said that the formula that determined MSPs for rabi crops was the most practicable. The Centre had in November last year announced MSP for the rabi (winter sown) season and the prices of most crops were significantly higher than 50% of the cost of production when the actual paid cost plus imputed value of unpaid family labour was used as a base to fix the margin. As this formula is delivering prices higher than the cost of production plus 50%, the government is not likely to seek other options. Some like a calculation of “comprehensive cost”, including imputed rent on owned land and value of capital assets, but such a formula is seen to be unwieldy and possibly prohibitive. “It is highly unlikely that the government would deviate from the formula which is realistic, considering various factors including the likely implications of MSP on consumers and price trends in both domestic and international markets,” said an official. Even the commission for agricultural costs and prices (CACP), which recommends MSP to the government, has noted on its website that the “cost of production” is an important factor that is an input in determination of MSP, but it is not the only one. The move to stick to the current formula may not please many farmer organisations that have been demanding that the MSP be fixed at higher returns. They noted that A2+FL formula (mentioned above) will not be in tune with the recommendation of the M S Swaminathan Committee which called for C2+50% (see graphic). Besides MSP, the view in the agriculture ministry is that it is time for states to bring in three key legislations— market reforms, contract farming and land lease issues—to provide farmers a robust system to protect their interests. The Centre has kept the model legislation ready for states to replicate or tweak it as per regional needs. While the contract farming law will allow farmers to enter into contract with private companies in advance for getting fixed price of their produce, the law on land lease would protect the interests of lessee cultivators or tenant farmers without affecting ownership rights of the landowners.